Have a Bump on the back of Your Heel? Also known as the “pump bump”, Haglund’s deformity is a condition that causes the bony section of your heel, where the Achilles tendon is, to become enlarged or inflamed. Wearing shoes that put too much pressure on the back of the heel, which causes inflammation, most often causes Haglund’s deformity. If left untreated, Haglund’s deformity can lead to bursitis, which is an inflammation of the fluid-filled sac that separates the tendon from the bone. 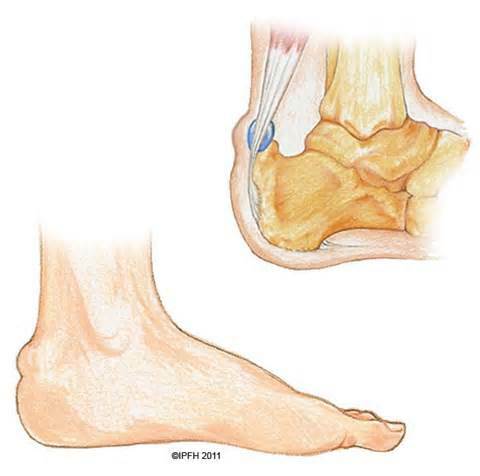 When the heel becomes inflamed, it can actually calcify the heel bone and cause the bump to become more prominent. When this happens, pain becomes more noticeable and basic foot function could be affected. Because its symptoms are so similar to those of other common foot conditions, Haglund’s deformity can be difficult to diagnose. Your podiatrist may be able to diagnose this condition based off the appearance of your heel, although some cases require further diagnostic and imaging tests to confirm the diagnosis.